The best way to organize all of the references in your library is to create groups. There two main types of groups in EndNote. Regular groups are created manually: You decide what references go into them. 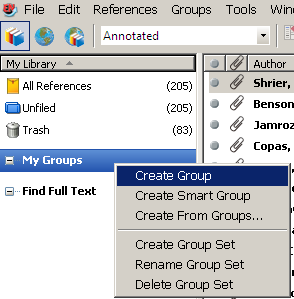 Smart groups are created automatically by EndNote. You set the criteria of what you want in the group, and every time you import or add a new reference into EndNote, EndNote checks to see if the reference should be added to the smart group. For example, you could set up a group where any article published in 2013 is automatically added. Type in the name of your group, and press “enter” on your keyboard. If a reference won’t drag into and be added to a group, click away to a different location in the left-hand navigation plane (like “all references,” “unfiled,” or “trash”). Then try again. You can also delete a regular group from the left-side navigation plane without any of the included references being deleted from your library. Click on “All References” in your left-hand navigation plane. This will let display all references in your library, and let EndNote know that you want your new smart group to search/draw from your entire library. Name your Smart Group (in the top box that says “new smart group”). Now, fill in your criteria/filter/settings for this smart group. Here is an example of a smart group that would contain every journal article published in 2003 or later. Please note that it is not recommended to create smart groups from keywords unless you are familiar with the keywords in your references. Most keywords in EndNote are assigned by the database, catalog, or website that you got the item from. Articles on the same topic, but saved from different locations, will have different keywords (“children” versus “adolescents”), or some references might have no keywords (e.g. Google Scholar does not save keywords). The closest way to creating a smart group by keywords is by using the “any field” or “any field and PDF with notes” fields. Click “create,” and your new smart group will be created. Please note that deleting a reference from a smart group will delete that reference from your entire library. EndNote will not give you a pop-up confirmation message that the reference will be deleted from your library. If you delete a reference by mistake, you can retrieve it from your trash (in the left-hand plane). You can, however, delete the entire smart group without any of the references being deleted from your library. 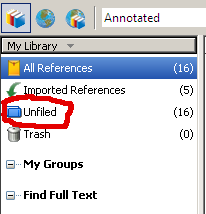 All references in your library that have not been added to a group are in your "unfiled" folder.